You can conduct seemingly easy experiment on your own after reading this article. Fill a glass with water (on any other liquid) and hold it in one of your hands. You can choose any other (light or moderate weighted) object too for this experiment. You might be thinking that what this fellow is asking me to do is what you do routinely - holding a glass, cup, mug or bottle in hand to drink water, tea, coffee or other beverages. You might be holding or handling these kinds of containers for less than 2 or 3 minutes on average at a single instance. What’s so different with this so-called experiment then? Specifications of the experiments are not over yet. I’m asking you to hold any object by stretching the hand straight and away from your body. You have to keep your hand steady and not let it bend at elbow. Obviously, you shouldn’t take support of anything and also take breaks at all. To arrive at a conclusion of the experiment, you should hold the object until you start feeling trembling, pains and tingling sensation in muscles of your hand. 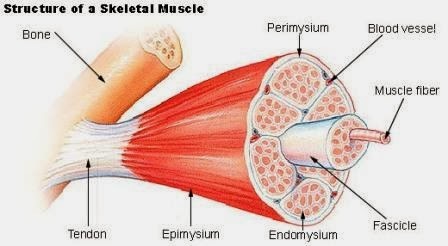 Why supposedly strong muscles, which have been sophisticatedly designed to lift heavy load than that of one you’ve hold in your hand, started to ache after few minutes only? Answer to this question, which you would know after going through rest of this article, is definitely eye-opening. Ancestors used to walk on four feet (limbs). Before evolving into tree dwelling apes, our remote ancestors used to roam on four limbs. 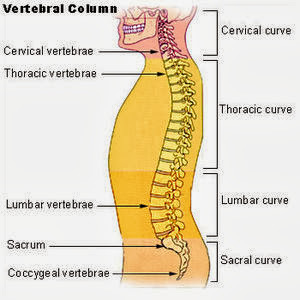 As we can easily observe, vertebral column i.e. backbone or spine of all four limbed (legged) animals remains horizontal. Standing and walking on four legs (i.e. quadrupedal anatomy) offers them more flexibility, good balancing ability and capacity to attain more speed while running. That’s why the fastest animal on earth is cheetah and not us. Almost all quadrupedal creatures can achieve balance and walk on their feet within just few minutes or hours after taking birth. "Human body's are more vulnerable due to its bipedal anatomy. The kind of posture one adopts conveys his/her confidence." On the other hand, we have a unique ability to stand and walk on two hind limbs or legs (i.e. bipedal anatomy) that we feel very proud about. This kind of anatomy allowed us to lift different things by forelimbs or hands, carry them, observe much clearly over a large distance with wider angle, climb flexibly and move from one location to other by spending less amount of energy. Moreover, bipedal anatomy gave men broader shoulders and women wider hips. However, bipedal anatomy also posed many weaknesses and challenges on human body. Probably you might know that spine has four different sections and curves - Cervical, Thoracic, Lumbar and Sacral. While standing, taking rest, walking or running on four legs; quadrupedal creatures hardly have to pay conscious attention at their body posture and natural curves of spine. Watch carefully at your dog or cat when it seats, stands or moves. Only in the condition of not having enough energy and essential body parts unfit or in a bad shape (infested, deformed, amputated or wounded), bad body posture could negatively affect speed of roaming, ability to perform different tasks and ultimately the four spinal curves. We too are not exception to this but I believe that humans suffer from spine related pains, deformities and decay by most. Unlike four legged creatures, we need to maintain accurate balance along with keeping upper body erect to carry our different kinds of static and dynamic tasks. To be able to adjust ourselves with various operational demands, we eventually alter spinal curves, distance between two vertebrae and pressure on whole vertebral column. We twist, jerk, pull or burden it instantaneously, momentarily or over a considerable amount of time. "Pat your back on your own frequently because it reduces issue of frozen shoulders. Simple idea but great effect!" As many anatomists would agree, our lower section of our back is not much perfectly designed (or not ‘evolved’ correctly through millions of years). When it comes to perform activities by adapting an erect posture, this very design defect speaks (and also ‘hurts’) very loudly. Perhaps only human baby needs to learn and also practice to walk on two feet. Ability to stand and walk with perfectly erect posture comes only after few years after baby's birth. We insist on good posture because it’s an inevitable part of influence and impression in society but we hardly relate it with health. Vertebral column or spine is a bridge of life force that flows between brain and other body parts. Vertebrae i. e. one of the bony segments of the spinal column that rests on other vertebrae with soft disk or cushion in between, is one of the biggest and also complex structures. It connects whole body with brain and also provides energy and signals to different body parts through spinal cord. Both stagnant life style and exhaustive workout done by adapting wrong postures accelerate the process of spinal decay and deformation. Like any other moving body part that is made up of blood veins, nerves, bones, tendons (band of inelastic tissue that connects muscles with bones) and muscles; spine or backbone is spring like construction but little more composite. One question might be raising in your mind - Why we experience inflammation and pains in back, neck or arms only few minutes after applying pressure or strain? Crucial importance of good posture, workout and physical activities won’t make sense properly until we don’t get answer of this big question. "Musculo-tendon pains and inflammation, if persisted over a long time, can lead to performance degradation and most importantly - deterioration of self-confidence." Composed by elastic and fibrous tissues, muscles have their own dynamics and chemical processes. Muscles remain fit and also painless when they are moved in regular intervals because only movements ensure supply of blood and oxygen. Lactic acid gets generated as by-product of exercise but it also needs to get washed out through adequate blood circulation. Holding any body part in a one position or configuration and putting strain on it in repetition causes contraction of muscles and ultimately disturbance in process of circulation of blood and oxygen. In absence of nutrition and accumulation of lactic acid, muscles start to ail, tingle and inflame. If muscular pain is not relived within proper time then it badly affects not only muscles but also tendons and nerves. 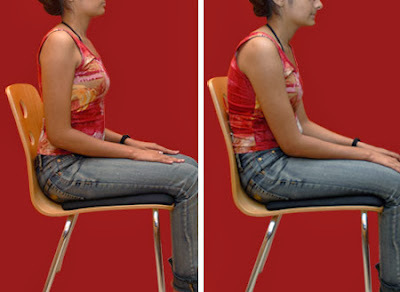 Which posture you think is correct one? "Incorrectly lifted load of 5 kilos puts pressure of 80 kilos on lumbar area i.e. 15 times higher than original weight." Spinal column is surrounded by muscles and tissues which provide support to the structure. While sitting at one location for a long time in any particular posture, we put pressure on our whole spinal structure and thus kicking off vicious process of musculo-tendon decay. Upper body weight also adds to the pressure, which is felt in lower back and abdominal region. If posture isn’t changed or any body movements are not made to re-establish sufficient blood supply then not just spine but all related body parts get exhausted and start to ail. Over a considerable amount of time (in months or years), person working stagnantly starts to feel lack of energy, enthusiasm and lightness from inside. "Nearly more than 80% of today's youngsters in cities suffer from pains in back, neck, shoulders, arms, wrists, palms and feet. Only reason is stagnation and wasting time with computers, cell phones and television." Although we all love luxury and relaxation, it's crucial that our body is moved and not stagnated for a long time. In fact, stagnation deteriorates it much faster as compared to a lifestyle filled with movements and actions. While sitting, walking or doing different tasks; only good body posture ensures spinal health and continuity of liveliness. Try to remain in a good posture as much as possible because it’s not just healthy but impressive too. Respect your body and pay attention at your posture. Be smart and stay healthy for a long time! "Stagnant lifestyle coupled with bad static and dynamic postures make situation worse or nightmarish." Over 2 - 3 years in past, I've gone through worst health conditions. Pains, swelling, inflammation of muscles and tendons in back, neck, shoulders and wrists was about to put me out of action permanently. However, excruciating conditions taught me a great lesson of life. I've successfully recovered from severe back pains by adopting proper posture, changing it frequently and doing rigorous exercise on regular basis. 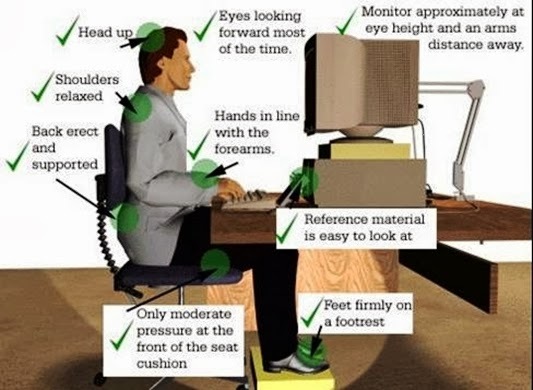 Good posture is a health insurance and very impressive too! It has changed my life and also how people perceive me socially. Would you still like to conduct the experiment, mentioned in first two paragraphs? Certainly not I guess. If you want to test that how your muscles and tendons respond to long lasting stagnation, go ahead and try it out carefully. It would end in ailing but I'm sure that you would become more conscious about your body and its dynamics. Your valuable feedback and suggestions are most welcome.